This post is not really going to be about homeschooling, however, as the writer of the blog I reserve the right to occasionally deviate from the main topic. 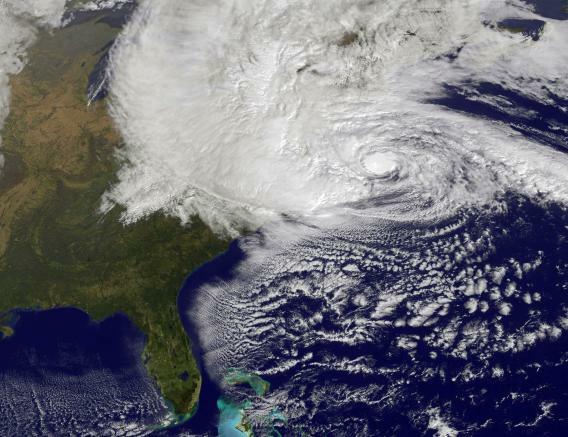 Today, I feel it is more befitting to write about some of my thoughts and feelings about Hurricane Sandy. Sandy was predicted to reach just east of us by Wednesday, by Monday we had already started feeling the effects, even though Sandy was several hundred miles away from us. On Sunday, schools were closed for Tuesday. We were not expecting Sandy to be a hurricane by the time it reached us, just a tropical storm, however, even tropical storms bring lots of wind and rain and that means potential flooding and fallen trees and limbs and loss of electricity. My Mr. Ham Radio Boy got a message saying that the Amateur Radio club is covering the emergency communication for the Red Cross shelters and were looking for volunteers. Of course Mr. HRB wanted to go, however, being not even 12, Daddy and Mommy had reservations. After finding out that the shelter he would be going to was fully staffed with about 8 adults, and talking to him about the 2-deep leadership we have in Scouting (you need 2 adults in a room if you want to talk to a scout privately, or at least 2 scouts in the room if there is only 1 adult), and how it is for the safety of everyone, we let him go. He spent 5 hours at a nearby shelter while the winds and the rain picked up. It was (and still is) amazing how 400 miles away from the storm, we were getting such effects! It was also amazing how the prediction was so far off. Sometime Tuesday morning, in the wee, wee early hours, it all basically stopped. The path went from 70 miles east of us to way west of us. Still, 12,000 homes lost power. As of Wednesday morning, there were still 5,000 homes without power, and today, Thursday, there are still 3,000 homes without power. Tonight, we have some wind and some rain again, and by looking at the map, the storm is yet again several hundred miles away from us this time northeast, but we are still feeling some of it’s strength even now. I have listened to the radio and viewed photos. The boys and I have talked about it. The damage is amazing, this morning the estimates were around the $20 billion mark. Such damage, such flooding is hard to really imagine unless one is right there, and even then it can take a while for reality to sit in. 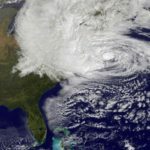 Millions of people were left without power, and it will take many days (a week and a half one person said in the Jersey area) to restore power to everyone. The amazing thing is that even with all this damage – damage that was more than predicted – only around 70 people lost their lives. Of course it is saddening that even 1 person lost their life, but if we think about the millions of people that were affected, and only 70 fatalities? I asked my boys how we know that Hashem is kind. One boy answered that it was because He kept his promise and did not destroy the entire world. Yes, that is true, but I was thinking that even with such terrible damage in such an extremely populated area, only 70 died. What was destroyed were things that could be replaced. Things can be replaced. People cannot not. Only Hashem can cause such damage and not destroy lives at the same time. At times like this, people are asking “why?” Why did Hashem do this? The answer is that we do not really know why. We can, however, see some amazing things come out of it. All the way across the country in Los Angeles, there is a restaurant that offered a free meal to anyone who was stranded because their plane was cancelled due to the storm. All they had to do is come in with their ticket and a free meal was given. Such a mitzvah! I teased my friend who was stranded there that she and her husband got an extended vacation. However, I know that extending a vacation costs money – food in the least, and perhaps hotel, car rental, laundry and other unexpected expenses. I believe on Tuesday I read an article about simchas that were suppose to happen on Monday and Tuesday of this week in the New York City area. The person in charge of the catering mentioned that several years ago something similar happened and the simchas went on as planned. There were three simchas that were suppose to occur – the Monday one was moved to today (Thursday), the other two on Tuesday occurred as planned. The caterers and hotels had generators and extra food for the extra people that were going to show up. The goal was to make everyone as happy and comfortable as possible. Life does go on! Simchas do still happen! When events such as Sandy occur, it brings out the best in most people. It is in times of hardships and sorrow that we all seem to pull together and help seems to flood in (excuse the pun.) I was listening to the radio this evening in the car for a few minutes and it was talking about Meals-On-Wheels. People are sending in food, but since there is so much damage for everyone, they are having problems getting enough food and enough volunteers. The volunteers they have that are delivering have a hard time finding working elevators, so they have to walk up (as in the example they told on the radio) sometimes 29 flights of stairs…in the dark. But they do that for they know the person on the 29th floor is in bed and cannot come out of his apartment to find anything. It is in times like these that we often find ourselves going beyond what we thought possible. These events also brings us closer to each other, and hopefully to Hashem. It says in this week’s parsha (Vayaira), the angels who came to visit Avraham asked him, “Where is Sarah, your wife?” (Vayaira 18:9) Rashi says this was to endear Sarah, his wife, to him. Even though Avraham loved his wife we see it is good to be reminded. Sometimes we all need reminding of what we already know. Sometimes we need to have in our conscious minds that we love our family and friends. It is hard to always remember when we are busy with our lives, so sometimes we need help remembering. We hope that we can have more of a reminder like Avraham had and not have to go through hardships to be reminded. Even through this pain, we can have comfort in knowing one thing – life will go on. Houses will be rebuilt, businesses will be reopened, and we will live. The people will not be the same, they will be stronger, better people. That is all fine and dandy for me to say, as I sit in my comfortable warm house, with lights on in too many rooms while my boys play in their dry basement. I checked in with my friends and everyone is safe and sound. Who am I to say that life will go on? How do I know how it feels? I am just an outsider. When I was about 8 or 9, we did have a flood in our house. There was no hurricane, but the rains just kept coming down. I remember looking outside and watching people with inflatable boats rowing down our street to friends houses and helping people who were stuck in their cars. I remember how, as a little girl, how scared I was that the waters were going to get a lot higher. I remember going downstairs to the basement where my bedroom was and moving everything off the floor and I remember we lost almost everything in the basement, except my bed for somehow the waters did not damage it enough. I had that bed until almost exactly 16 years ago to date. 16 years ago, this month, while all us children were still living at home, I was out working and I got a frantic call from my sister. Our house was on fire. We lost just about everything in a matter of minutes. The thoughts that first night of “I don’t even have pjs, let alone a toothbrush” ran through all our minds. There was the call I made to my husband, who, at that time I was only dating and trying to get the words out of my mouth. There was the first time I went to the house. It was cold, very cold, there was already layers of snow and ice on the ground. The freezing fingers as we tried to pry frozen items from the ice, trip after trip, day after day and the time when my mother found her wedding rings but since her fingers were too cold to go back upstairs that last time, decided to go home; only to find out that by the time she got there the next day, they had been stolen! The chuzpah! How could someone be so low! Going to a home that has already been destroyed and you take what precious little remains! And don’t forget turning on the news, and for almost 2 weeks, the news channel showed OUR HOUSE burning, day, after day, after day. But we got to see something else as well. Something that I will never forget. There was the warmth of friends who took us all into to their home the first night and the empty home that other people had that they gave to us, RENT FREE (though I think we got our insurance to pay something.) Oh, and the dear friend of mine who not only sent over some crayons and papers for the littler children, but even a few needed rolls of toilet paper! And not to forget the call my mother received from the JCC – “Are you going to come and take any of the clothes that we have collected here for you?” What clothes? A previous teacher of my brother heard about what happened and started a collection at the JCC. By the time my mother came to look, there was a mountain of clothes that was donated by the entire community! Amazing! The feeling of achdus from people we never knew. So here I am, almost 16 years later, as someone who really knows what it is like and really has been there, and I can tell you from experience that yes, life really does go on. Happiness will be had. Initially things will be hard, that is a fact, but remember to look around you and see all the wonderful things – all the little things that people are doing for you and for others. Perhaps, even with our own troubles, we can help someone else. We do not know why these things really happen, or what exactly we are suppose to get out of them, but one thing is for sure- there really is good that comes out of it. Good from others and good from ourselves. To all those that were affected in any way – great or small – please remember that you are all in our thoughts and you really can get through this. Remember what really counts – the house can be rebuilt, the pots can be replaced – make sure your friends and loved ones are safe and we all have each other. May Hashem help you all and keep you strong. You can do it. I know.